Aussie Natural Filtration dispensers are highly efficient and compact. Like the standard coolers, our water filter range only requires up to one square foot of benchtop or floor space making it easy to fit a cold water filter dispenser into your kitchen or shared workspace. Aussie Natural Filtration can provide clean, refreshing water to meet a range of needs and requirements, at a competitive value that doesn’t cut down on quality. Our filters work by passing the mains water supply through additional filtration to remove any chemicals and chlorine added during the cleaning and disinfection of your mains water supply. We accomplish this by passing your water through a 5-micron filter and carbon filter, to ensure that any unwanted particles are removed from your drinking water. As an element of your rental agreement, the Aussie Natural Filtration team will ensure that your cold water filter dispenser is serviced at regular intervals. Regular maintenance can prolong the lifespan of the filter system and guarantees a continuous supply of clean, delicious water every day. The installation of Aussie Natural Filtration systems is quick and easy. 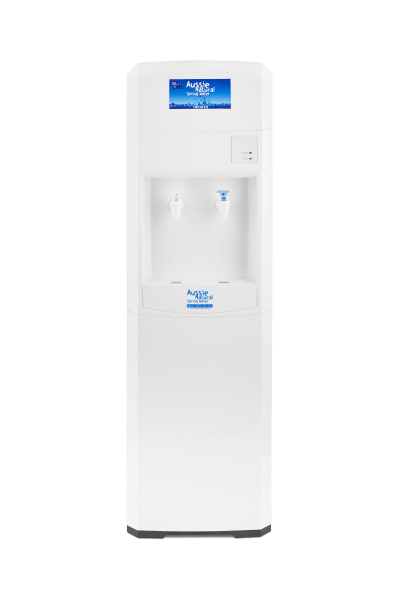 The Aussie Natural trained and qualified team will have your new water filter cooler dispenser in place and ready for use with minimal disruption to your working day. Clean and clear drinking water is one of the essentials of life – we don’t believe that you should have to wait around to enjoy it. We aim to make installation simple so that you can enjoy delicious water in no time at all. Cool & Cold water filter systems are available to rent at competitive pricing. Enquire now for the latest pricing. The Aussie Natural Filtration cool and cold water filtration systems are the most compact and convenient way to ensure that you and your family always have access to delicious, fresh water. Whether you want a cool glass of water as a refreshing drink or want to prepare food, make coffee or even rehydrate a quick lunch packet, an Aussie Natural Filtration unit is ideally suited to your needs. Our range is the perfect size for any home, workplace or office, as they only require one square foot of benchtop or floor space. So, even if space is limited, we can offer a cold water dispenser to suit your specific needs. If you would like to find out more about the range of options to have a cold water dispenser with filter in your home or business, contact us. A member of the Aussie Natural Filtration team would be delighted to discuss your requirements and explain the available options from our wide range of cold water filter dispenser models. We would also be happy to answer any queries or questions you may have.